I think you need bigger and will like a bigger tractor than a 4100 for your application. A back blade IS the way to go for the drive, I would go with one that has a replaceable cutting edge. Sounds like a good finance rate, is that on AL JD's or just the 4100? Garret, I have a 4100 HST with a FEL and have been successfull at knocking down small trees. Clearing out a few acres would be pushing things though. Since you have construction going on, I would suggest that you have them cut out what you do not want before using your tractor to clear your property. The FEL is good for moving materials around and general pushing stumps, etc. I would suggest that you get a rear blade to remove snow and grade your driveway. I only have had my 4100 for a few months and have talked with neighbors and Jplan posters/repliers and found a wealth of information. Everyone seems to agree that a rear blade is much more helpful than the FEL for leveling and grading. I haven't purchased one yet myself but will have one before the end of summer. Additionally, if you can afford it, you may want to consider the 4200 as it will give you a little more power for the money and help you with some larger tasks. Hope this helps. .
KlayW: I believe that rate is for all 4000 series. I saw an ad in my local paper just yesterday. Terry: Thanks for the personal experience. I'll price out a 4200 also. Don't count me in on your list of "everyone thinks a backblade is the way to go"! I'll admit it is better than a shovel, or a walk behind snow blower. It is the cheapest, and you can get by. But, the way to enjoy snow plowing is with a front blade, and the option to be able to quickly switch to the loader to bucket the snow away if drifting is a problem, or the snow gets too deep along the edge of the drive. Backing up to clear snow, or driving over the snow to hook it with a back blade is NOT my idea of enjoyable. I've been clearing snow for nearly 40 years on a 700' gravel drive, and enjoying it for the last 35. For ground engaging work like grading and landscaping, a small tractor can do pretty much the same work as a large tractor. It just takes longer because the implements are smaller. Of course, a small tractor can save time because it maneuvers around buildings and landscaping faster. It's mostly a saw-off between speed and maneuverability. More ground speed means a bigger tractor, which also means more maneuverability problems. One thing to keep in mind is that the 'development' of a property can usually use 'bigger' equipment to advantage. However, intensive development usually only lasts several years, but maneuverability problems last the life of the tractor/property. It might be a good idea to categorize the tractor jobs in terms of immediate one-time uses or on-going long-terms uses. It's probably better to get a tractor that's best for the long-term, and if necessary, hire out a few of the heavy-duty one-time jobs. On the other hand, there are jobs where size isn't just a matter of time. Small can stop you cold. I've got a bit less land and a 24HP (PTO) tractor for the following reasons: I needed to trench to 5' to be get below frost here. A small tractor can't manage a backhoe that's large enough. I do quite a bit of building construction and maintenance. Materials are delivered on pallets that may weigh 1500 lbs. A tractor really isn't very useful unless it can pick pallets off a flatbed delivery truck and take them where needed. I use a 3ph forklift for pallets. Other people use forks on their loaders. It's a good idea to think of what needs to be lifted and to get a tractor with adequate 3ph and loader capacity. Dealers really are pretty good at putting together packages based on what purchasers say they want to do. I’d see what a couple of dealers say. The responses from here should help clarify what you tell a dealer you want to do. I'm with Kay in that I don't have much use for clearing snow with a back blade. Maybe that is because we get deep snows much of the time. A snowblower may be optimal, but in the meantime my FEL works well for me. I clear about 150' of driveway and a 50' x 60' parking area. Thanks for the replies! Tom: I see your point. With 5 acres and a wife who has alot of good ideas on landscaping, I AM looking at this as a long term project. If we knew what we wanted right now, then yes, I would do a Terry suggested and hire out the clearing of the property. I mainly wanted to know if the 4100 (now leaning to the 4200) had enough 'oomph' to push over the small trees. I also agree with the comments about using the FEL for the snow, that really wasn't an issue. But what about grading the driveway with it? Why WOULDN'T I want to do that? 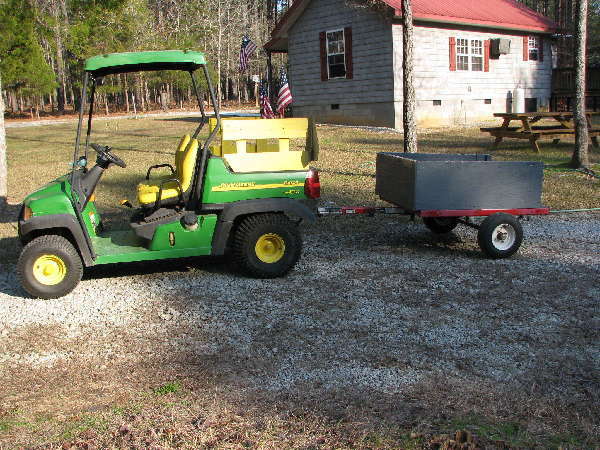 What are the recommendations for the mower? Can I assume a rotary cutter? The one acre field area is a portion of a former farming field, no trees or brush, just grass. If you have a long gravel drive to grade you really want both an FEL and a box blade. The box blade will produce a better result, faster than using an FEL alone. I recently acquired a 5 1/2 foot box blade. I used it to repair a fairly large and deep erosion channel in a steep gravel ramp that goes from my barn to the pasture. I used the FEL to move new gravel to the bottom of the ramp, backed the blade over the load and dragged it up the slope. It only took four repetitions to completly fill in the damage. I then back scraped the ramp with the FEL to compact the new material. Total time was less than 1/2 hour. When I get back to the ramp, I'll crank up one side of the back blade and use it to cut a crown into the surface. Over time I'll start using the scarifiers so that I won't have to bring new material in. I figure the 4100 would really strut itself stuff if a major job were finish mowing in a heavily landscaped yard or generally working in tight places. A larger tractor would get other type jobs done a bit faster. I can't answer the question about pushing down trees, but the question does bring up the subject of tires. The choice of tires is about as important as the size of tractor. Basically, you can't drive on lawns with ag tires, but you can't get good pulling traction with turf tires. Turf tires wouldn't be too good for pushing down trees with any size compact. Compacts tend to be more limited by traction than by power. Larger tractors do have more traction because they are heavier and have larger tires, but some traction can be added to any tractor by adding ballast. Regarding grading with loaders: Much like snow removal, some people have good luck with loaders, but I never got the hang of it. I got a box scraper with hydraulic top-link that I greatly prefer for grading and probably just didn’t develop the knack. I do some types of spreading and compacting with the loader--mostly back-dragging with it. The scraper makes for much more controlled cutting and spreading operations. A loader can't cut and spread at the same time very well, and they can't cut side-grades. A crown can be built on a drive by using a scraper and the 3ph side-leveler. Regarding cutters, I hear that rotary cutters do a surprisingly good job of finish mowing. Maybe somebody will comment, but I think that some types of cutters may be better at producing a mowed ‘pasture lawn’ than others. I believe that a common type with a single tail wheel doesn't produce a very level cut if bumps, dips and hills are present. Anyway, I wouldn't agonize too much over the tractor size. Almost any size tractor is going to be useful. Mostly what happens is that the owner adapts to the tractor. Size just affects the range of jobs the tractor gets. There's always going to be hired out jobs and standalone equipment. The object, though, is to keep a tractor busy, because they're pretty expensive things to have just sitting around. In general, the more implements available, the busier the tractor. The tractor is expensive and implements are cheap. so, buying implements is a pretty good way to increase value of the tractor investment.